Note: This post contains spoilers on Eureka Seven AO and Eureka Seven. If you have not seen both of them, avoid this post. It is okay if a sequel wants to be different from the original series. It can have a different story, different characters or different themes. But it should not go against everything the original series stood for, completely disregarding its message, unless there is a good reason for it. This was the final straw for Eureka Seven AO. In every other post I have pointed out what Eureka Seven AO did wrong on its own. Now let me tell how you it completely ruined the ending Eureka Seven. “Thank you. Your emotions have all been engraved into my Compac. At last, I will be able to attain enlightenment. Now, live. On this planet. Live together, and show the way to all who live on this planet. With the light called “hope”. Eureka Seven was a love story that told the tale of the young human Renton who fell in love with a Humanoid Coralian named Eureka, whose goal was to observe and communicate with mankind in hope of creating peace between the two life forms. After 50 episodes of struggles, hardships and tears, we finally saw them come together. We saw the Scub Coral finally being able to settle down and be understood. But this did not last long because half of them had to leave due to endangering the whole universe. Exactly where they went is unclear. 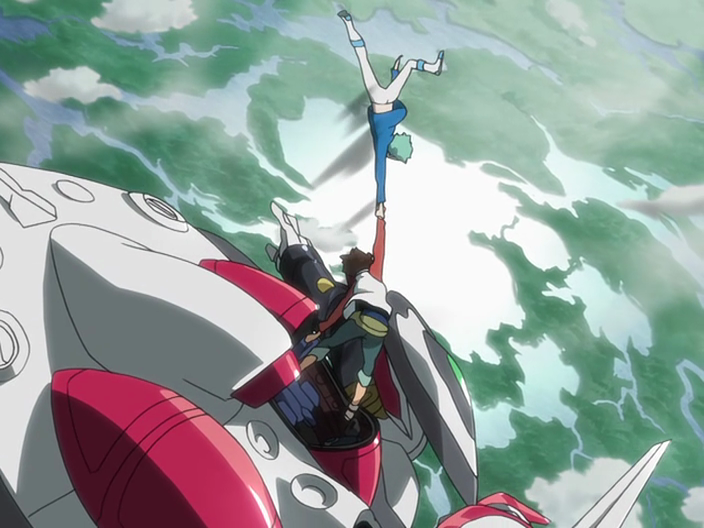 Eureka Seven AO takes their leave literally, as if they travelled to a parallel universe. My, slightly magical, take on this is that they went to another plane of existence. They stopped being, if we put it easily, physical beings as you and I. It was a happy ending, telling us that co-existence is possible even if you are different and that love conquers all. Not only is this a beautiful message in itself, but it is also something our world needs more of. Instead Eureka Seven AO decides to continue this, by suddenly making the Scub Coral merciless enemies, making Renton and Eureka suffer the loss of their children and making everything the characters fought for in Eureka Seven a lie. You cannot co-exist. Love does not conquer all. This is where it all goes wrong, by completely going against the message of Eureka Seven. The worst part is that it is not even executed well. I can only speculate what went through the minds of Bones when they decided to do this, killing their own franchise. But right now, I do not want to. 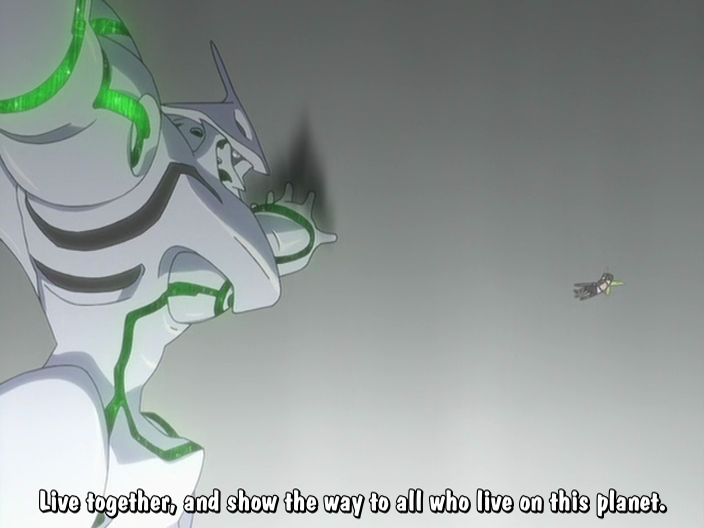 I just wish to spread the message of Eureka Seven to you all. Co-existence is possible and love does indeed conquer all. Such a message is what our world needs right now. This entry was posted in Anime, Editorials, Eureka Seven, Eureka Seven AO, Series and tagged Anime, Bones, Coexistence is possible, Eureka Seven, Eureka Seven Ao, Hope, Kiss, Love, Love conquers all, Pretentious. You really should have noted in this post Renton tried to erase Eureka from existence. He was gunning to eliminate the Scub Coral from existence, which would have resulted in her never being born. I think you have managed to articulate why I feel this show is a betrayal of fans of the first series quite well. Being a fan of a few franchises with less than stellar track records in the “don’t troll your franchise’s fans” department, I can honestly say that this is worse than what I have encountered with those other franchises, by a long shot, for all of the reasons you have put forth in these posts and more. What I think this writing team was attempting to do was inject reality into the franchise by attributing consequences to the resolution of the first story. This, as you highlighted, is disrespectful to the spirit of the original story. Psalms of Planets was a fairytale. Was it realistic? No. Does anything ever end up like that in the cauldron of the real? Not likely! This, however, was never really the point. The viewer is getting something a little different when they watch PoP in that 50 episodes of character exploration, conflict, development, and interaction are rewarded in the end with a spectacular and poignant resolution that validated all 50 episodes. There are other anime (Evangelion comes to mind for some reason) that take the real and caricaturize it for our entertainment using cause-effect relationships, personality/character flaws, and mental or physical trauma to frame a story that we can relate to because it could possibly mirror what could be going in the viewer’s mind or world. The thing is, the Evangelion series was also validated by its ending (I’m referring to EoE, not the final two episodes) which, in finality, reemphasized the concepts and meaning of the series while bringing resolution. It was a story of pain, loss, regret, and the fact that you can (and will) still experiences the worst even if you make choices that you feel are correct. You’re on point when you say that this is NOT what Eureka SeveN was all about. The thing that is, perhaps, most impressive about the original is that the struggles associated with relationships of all types were on display through the series. Character interactions of varying types and outcomes occurred, lapses in communication lead to conflict and often unnecessary alienation, real world events separated characters both physically and emotionally, and so on. Unlike works like Evangelion that wish to delve into the seedy backstreets within your mind and soul and turn the streetlight on, Eureka SeveN is, in a way, the opposite in that it could serve as a social blueprint of sorts… “This is not the way you treat people… here is why… this is more acceptable… here is your positive outcome”. Your conclusion is correct. AO did not merely serve as an epic failure by Bones as a series unto itself, but also soiled the franchise and disrespected the very spirit of the original story. Your post(s) have really done a great job in explaining your disdain for AO. I tried to like the first Eureka Seven but the main romance was just unbearable to watch, particularly Renton who drove me up a wall everytime he open his mouth and I dropped AO right before he came back. Now, this post says the main point of E7 was the romance but I have to disagree. I felt the characters in E7 were very realistic, even if I plain hated them (Renton), and to finish all 50 episodes even when I hated the Renton/Eureka romance says a lot about the great characterization the first E7 had (and the music too), and how shallow AO’s character including Ao himself were. There was no Holland Novak, no Charles and Ray Beams, no Anemone, just no one I could care about in AO because they just felt too one-dimensional. I know what you’re thinking: how could I still watch E7 if I didn’t like the main driving point of the show? Because it had great characters, along with great music. What did AO have? Truth and his many bizarre-o faces. That’s it. Oh and Noah I guess. TL;DR – I had issues with E7 (the romance aspect), but the characterization was solid along with the awesome music. AO could not even muster “decent” on any level. I can definitely see why you would dislike the romance, because it reaches certain annoying parts (it goes from emo to lovey-dovey (it kinda annoyed me (but it was natural character growth)). Renton can also be annoying, but at the same time, very well-written and, for the most part, realistic! Just as you said, the characters are damn well-written, even if they don’t have a big part in the series. 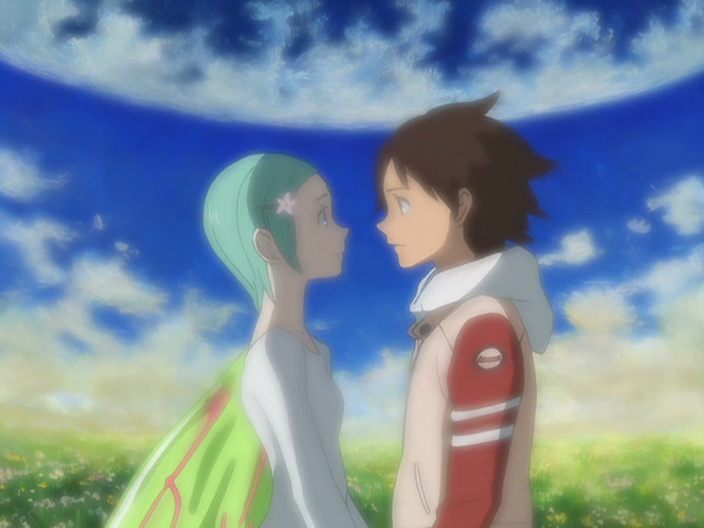 Personally, Eureka Seven will always be a love story about co-existence, though. Of course it was emo, lovey dovey what the hell did you think would happened when you threw the fate of the world into the hands of emotionally distraught and broken 14 year olds? They both had so many problems forced to kill Renton lost his family Eureka had none used/abused same with anemone what you didn’t think they would act like annoying children? not to mention the constant fighting for survival and being hunted by almost the entire world ect ect what you were expecting some mature adults knowing how to interact and what the consequences of certain actions will be and crap? What are you even talking about? I never once said it was bad. I praised Renton for being well-written and realistic. Just because he can be annoying doesn’t mean he’s bad – one can be annoying while still well-written. The reason he’s annoying is precisely because he’s a kid. And I love him for that. Perfect. This is exactly what made me so angry with this show. I understand sequels need to tell their own story but to go against everything Eureka Seven had stood for is just not right. While I wasn’t the biggest fan of the original E7 I regard it very highly simply because it knew how to develop characters (one of the best in my opinion). After all, E7’s characters were just as important, if not more, than the world itself. It was about people coming to understand each other while learning about themselves at the same time. Not having that in the sequel (I’m looking at you Ao and Naru and no it’s not all romance related) is just blasphemy. I don’t even understand why some of these characters even existed. What a waste. ***Spoiler*** But this one somehow confusing, E7 is happening in 10000 years after AO. And in E7 the story already told that 10000 years ago Human left Earth because Scub is merciless then after consume the planet, it realize that they are alone in planet. When human back (E7 timeline) Scub Coral is very careful to act toward Human. This is all I can sum up. 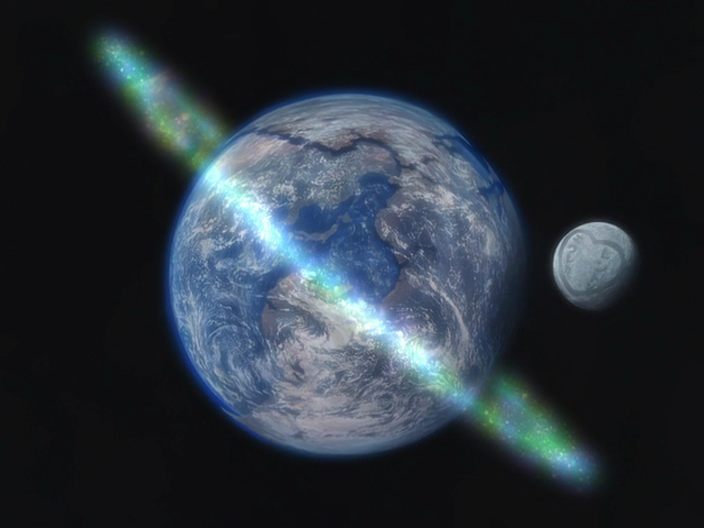 In Eureka Seven, humanity left Earth due to Scub Coral being aggressive. However, that was not Scub Coral’s intention. They merely wanted to learn and communicate, but they were not “proper beings” like humans, which led to confusion. Eventually Scub Coral realized that they were lonely, being the only intelligent life form besides humanity. As such, when humanity finally came back to Earth (and thought it was a different planet due to Scub Coral having terraformed it), the Scub Coral didn’t do anything. Instead, they sent out humanoid coralians (e.g. Eureka) to “spy” on humanity in hope of one day being able to communicate. And then we enter the story of Eureka Seven. From the beginning, Scub Coral never had any evil intentions. They were misunderstood. 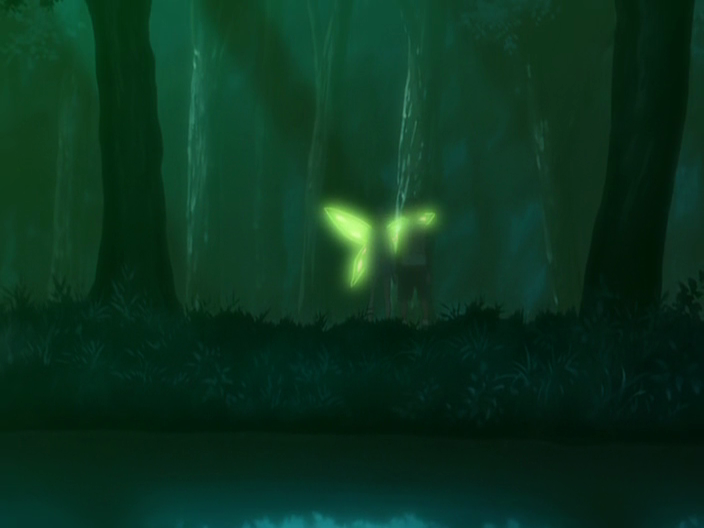 Now, in Eureka Seven AO, they are suddenly evil beings again. This does not make any sense in regards to what was told in Eureka Seven. The Scub Coral we see in AO are the same we met in Eureka Seven, which is explained via the dimension/universe/time-thingamajig AO tried to pull. That is a wise decision. I’m happy I was able to help. 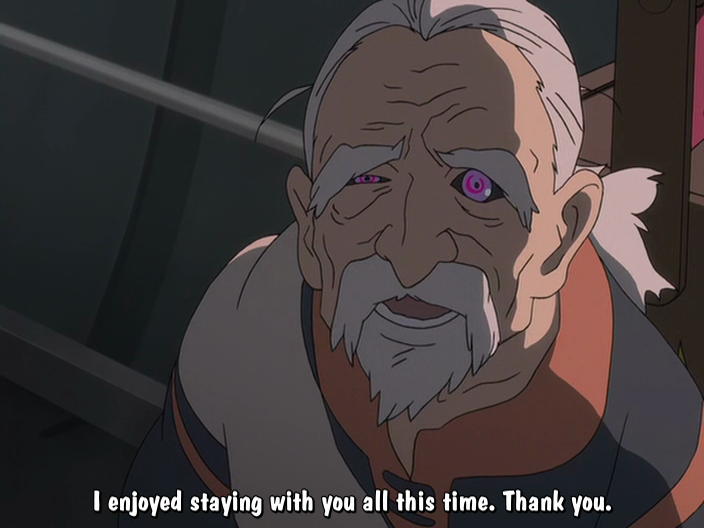 So I just finished watching both Eureka Seven and Ao(lol where have I been in the past 9 years), and man I must say, what an emotional rollercoaster. E7 is my #1 anime now. After I had finished the series I decided to look around online to see what people thought of Ao cause I really didn’t know what to make of it(the ending was just wow -_-), just really confusing and empty, though I did like a few connections to the original series (when Renton asks Ao if he likes playing soccer for example), and it was nice to see Eureka and Renton again. I was suprised that no one in my school had ever heard of the series so ive been recommending Eureka Seven to everyone I know. I had been wondering why Eureka Seven didn’t seem to be all that popular and now I know why (Ao killed it). What I’m wondering thout is why the “sequel” timeline had to be so messed up? My thinking is that if the storywriters were going to make Trapar levels affect child birth, the sequel could of focused on Eureka and Renton looking for a cure, and at the same time (since Talho was also pregnant) the story could of focused on Talho’s child, the annoying triplets, and Ao growing up together in a world where there was still prejudice against the Scub and Coralians (they could of been the next generation of Gekkostate members). So that at least both E7 and Ao would continue to support the same message. I think that the sequel would of been nice (even if E7 was really good on its own) and that there was a lot more room for plot and character development. Nevertheless, I still hold true to the original E7. Thank you very much for the review! Eureka Seven is one of my favorites too! It’s such an amazing journey spanning over 50 episodes, using each episode to its advantage. It dares to start slowly, which I think is great. – There are no trapars here. – Right now, in that form, trapars are nothing but poison for Sakuya. Seeing as they were worried about trapar it might mean it actually can be dangerous to humans! Still, it doesn’t make much sense when you consider what AO later did. 1. I believe they try to make it clear that AO is in ‘another’ universe and not just another time along the same line. There were no Secrets in the original series. The story stated the Secrets were the defense mechanism of ‘that’ universe. In the original E7 series, the coralians state clearly that they are ‘seeking their own way to coexist with humanity in another universe’. It seems to me the Scubs chose poorly in AO’s universe and the hornets (Secrets) attacked. 2. >>I believe that Renton really only wanted destroy the Scub Coral in AO’s universe so he may live in peace.<< Otherwise, destroying the origin of all Scubs would likely damage everyone's existence, not that anyone would be aware of the changes. 3. I was hoping for a more linear sequel like a lot have fans have voiced. Alternate timelines, alternate universes, and other such sidesteps on a story have been overworked for a while now. A new "WOW" concept in a linear E7 story would have been "higher than the sun!" However, E7- AO was a decently written story once I got over the 'panic' that none of it made much sense at first. I would have to say you are oversimplifying the story of Eureka Seven. It is not simply a story of love and co-existence. It is about the hardships of the world and how cruel it can be. I won’t delve into the details as if you are a true fan of the series you should know all of them (An example being Ray’s inhibility to get pregnant or everything that came from warsaw and thats just to start). 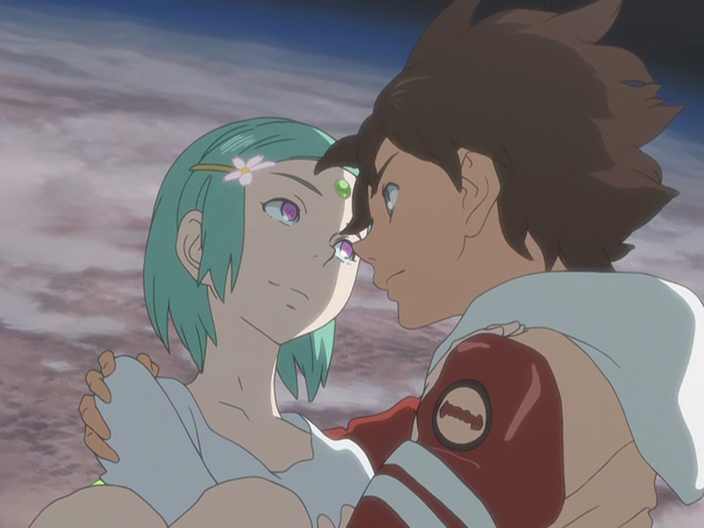 Eureka seven AO is continuing bones original story through Ao’s perspective. Sure there are plot holes however all the core story elements the original had are there in the sequel. Of course it is no where near as good as the original however I think they told a beautiful story in half the ammount of time they had for the original. A squel does not have to follow the original by any means either. This is not a story about eureka or renton. This is AO’s journey. It is a story about hardship and sacrafice however it is also about love and self discovery with elements of co-existence(Naru) (truth) it is a story about the repercusions of rention and eurekas actions if you want it put in a way that makes it sound more like a sequel than a stand alone. What im trying to say is that i think you missed the underlining themes of the original because everything that the sequel did as far as explaining eureka and renton with ao’s reaction to them were the best parts. More or less i think they portraid their story and art in a great way yet again. Not as amazing as the original but hey lighting doesnt strike in the same place twice right? Thats my opinion anyway! I felt the exact same about this series and its ending as you did regarding how it betrayed the original story’s purpose and message. You know what I took away from this? There’s even a meme of that.